Storing carbon dioxide (CO2) emissions produced by human activity underground helps address climate change by keeping this greenhouse gas out of the atmosphere. This is not a new or emerging technology – it is happening now. In fact, there are numerous geological systems that naturally contain CO2 and have stored it for millennia. As well, the oil and gas industry has used CO2 for decades for enhanced oil recovery (EOR). There are many similar geological systems throughout the world that can retain centuries’ worth of CO2 captured from industrial processes. Although geologic storage of gases occurs naturally and has been used safely by industry for many decades, it remains a challenge to describe this process to the public. How does geological storage of CO2 work? Geological storage involves injecting CO2 captured from industrial processes into rock formations deep underground, thereby permanently removing it from the atmosphere. An extensive cap rock or barrier at the top of the formation to contain the CO2 permanently. Fortunately, there are many locations globally that have formations with these characteristics; most are in vast geological features called sedimentary basins. Almost all oil and gas production is associated with sedimentary basins, and the types of geologic formations that trap oil and gas (and also naturally occurring CO2) include sandstones, limestones, and dolomites that are similar to those that make good CO2 storage reservoirs. 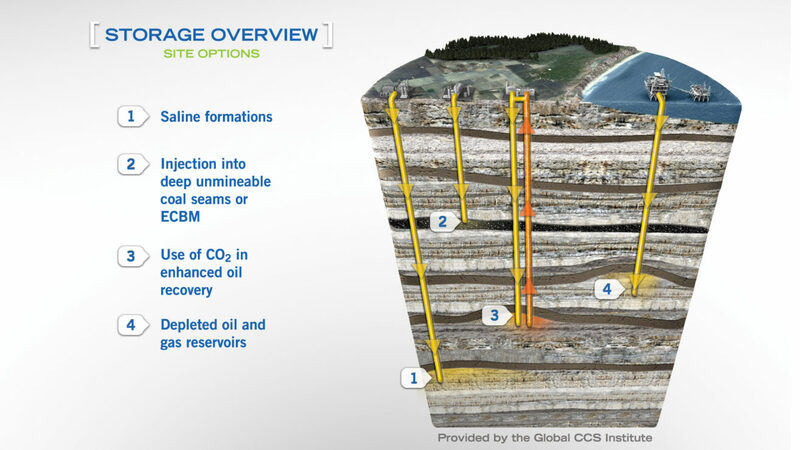 It is the natural geologic characteristics, the ones that resulted in oil and gas being trapped for millions of years before they were discovered, that make secure geological storage of CO2 such a viable option for greenhouse gas mitigation. Many coal deposits are also associated with sedimentary basins, so coal-fired power plants, which are a significant source of CO2 emissions, can sometimes be collocated near storage sites. In other instances, and for other industries, suitable storage locations may be considerable distances away. Deep saline formations refer to any saline water bearing formation (the water can range from slightly brackish to many times the concentration of seawater but is usually non-potable). The saline formation is sealed by a caprock for permanent storage. Coal-bed methane, in which CO2 is injected into coalbeds to exchange CO2 with methane. CO2 binds to the coal and is stored permanently. Currently, this type of storage is in the research phase, with no operational projects. EOR, which involves injecting CO2 to increase oil production from mature oil fields. Depleted oil or gas fields that are no longer economic for oil or gas production but have established trapping and storage characteristics. How is CO2 injected underground and why does it stay there? Once captured, the CO2 is compressed into a fluid almost as dense as water and pumped down through a well into a porous geological formation. The pores in underground formations are initially filled with a fluid – either oil, gas, or salty water. Whilst a majority of existing CCS projects utilise storage associated with EOR, future deployment of CCS will increasingly require storage in deep saline aquifers, which have wider geographical distribution and larger theoretical capacity in comparison to oil and gas reservoirs. Because injected CO2 is slightly more buoyant than the salty water that co-exists within the storage reservoir, a portion of the CO2 will migrate to the top of the formation and become structurally trapped beneath the impermeable cap rock that acts as a seal. In most natural systems, there are numerous barriers between the reservoir and the surface. Some of the trapped CO2 will slowly start to dissolve into the saline water and become trapped indefinitely (called solution trapping); another portion may become trapped in tiny pore spaces (referred to as residual trapping). The ultimate trapping process involves dissolved CO2 reacting with the reservoir rocks to form a new mineral. This process, called mineral trapping, may be relatively quick or very slow, but it effectively locks the CO2 into a solid mineral permanently. Is underground storage of CO2 safe? Industrial-scale, pilot, and research-scale storage projects inject several millions of tonnes of CO2 annually into deep saline formations, demonstrating that injection is safe and effective. EOR projects, where CO2 storage occurs incidentally, have been operating safely for decades. This has been validated by the work of intergovernmental and industry partnerships, research programs, and stakeholder networks. No significant safety, health or environmental impacts have been documented from existing CCS projects, whilst the EOR industry has an excellent safety record over four decades of operation. The oil and natural gas industry has more than 40 years’ experience of injecting almost one billion tonnes of CO2into geologic reservoirs to increase oil production. This is called CO2-EOR. The CO2 is usually injected into the reservoir under pressure in a liquid or dense phase, which allows it to mix with the oil and make the oil flow more easily, ultimately producing more oil. 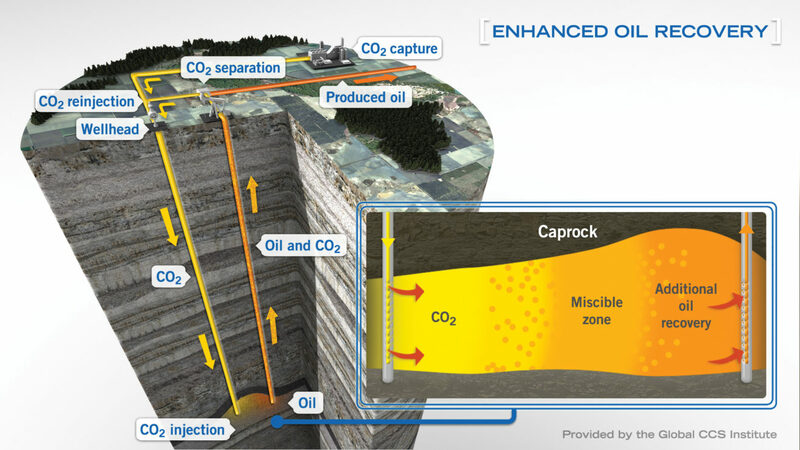 The CO2-oil mixture is brought to the surface, where the CO2 separates from the oil, and is recaptured for re-injection. Through this recycling process, all the CO2 used will eventually remain in the reservoir indefinitely at the end of the oil field’s life (called incidental storage). 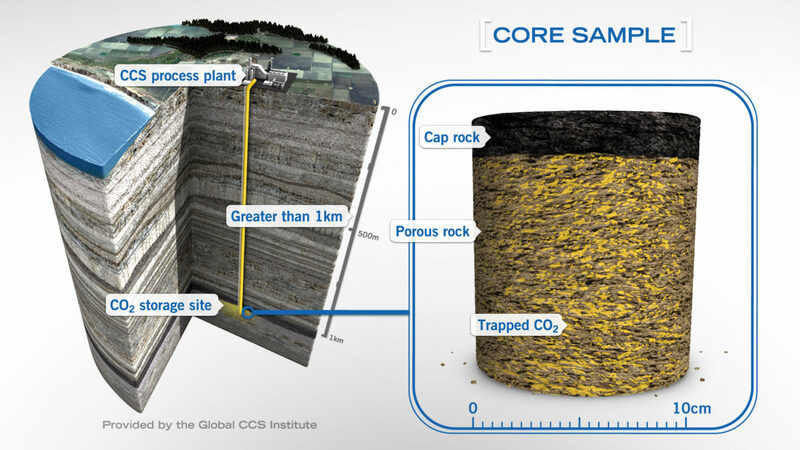 Large quantities of CO2 can be stored underground – safely, securely, and for a very long time. How much CO2 can be stored underground? The United Nations Intergovernmental Panel on Climate Change (IPCC) estimates the world’s potential capacity at two trillion tonnes, although it may possess ‘much larger potential’ (IPCC, 2005, Special Report on Carbon Dioxide Capture and Storage: Summary for Policymakers). More recent and focused studies in North America, Europe, Australia, and elsewhere have shown that in many regions there is centuries’ worth of CO2 geological storage potential in saline formations and oil and gas reservoirs. The proximity of CO2 sources and suitable geological storage sites will vary according to a number of factors; many regions and sources will have a variety of convenient storage options, whilst others may need to invest in more significant transport systems. In some regions, limited storage options may restrict the potential for CCS deployment’. also one of the most closely scrutinised aspects of CCS by the public. Injecting CO2 into mature oil fields has been a method used to enhance oil production for about 40 years. Enhanced oil recovery (EOR) refers to a suite of techniques that can be applied to reservoirs with declining oil production to maintain or improve production. Most fields considered for EOR have already undergone primary production, in which the natural reservoir pressure brings the oil to surface, and secondary production methods, usually by injecting water to restore reservoir pressure. Using CO2 for EOR (CO2-EOR) has proven successful in rejuvenating oil production in many maturing oil fields and extending their productive lives by decades. The degree of improvement in production is highly dependent on site-specific reservoir characteristics and oil composition, and not all oil fields are amenable to CO2 EOR.